United States. 1st Cong., 3d sess., 1790-1791 Congress of the United States: begun and held at the city of New-York, on Wednesday the fourth of March, one thousand seven hundred and eighty-nine. The conventions of a number of the states having at the time of their adopting the Constitution expressed a desire...that further declaratory and restrictive clauses should be added…Resolved...that the following articles be proposed to the legislatures of the several states, as amendments to the Constitution... [Philadelphia, Printed by Childs and Swaine, 1792]. The Bill of Rights, or the first ten amendments to the U. S. Constitution, guarantees personal freedoms, limits government power and reserves some powers to the states and public. James Madison introduced the amendments to the United States Congress in 1789. They came into effect on December 15, 1791 by ratification of three-fourths of the states. The Posner Collection item is one of 28 copies in the first printing (two for each state) that were sent by Secretary of State Thomas Jefferson to the state governors on March 1, 1792. 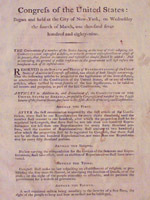 The eleven-page document presents the original twelve proposed amendments and records each state's arguments and vote. The first two amendments, dealing with congressional size and pay, were not endorsed because of their administrative nature.